This is a square Eagle Paint and Varnish Co. porcelain sign. 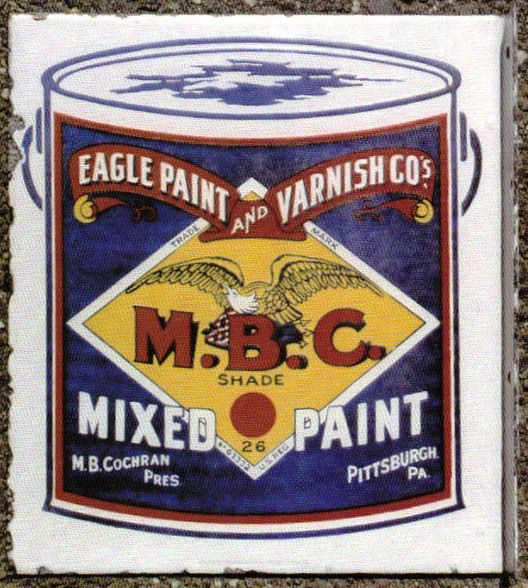 This particular Eagle Paint and Varnish Co. sign features a blue can of Eagle Mixed Paint against a white background. It reads, “Eagle Paint and Varnish Co.’s M.B.C. Shade Mixed Paints, M.B. Cochran Pres., Pittsburgh, PA” and has a gold eagle inside gold diamond in the center.